Please fill in and email your forms to baldurgan@eircom.net and honsec@ssaireland.com ASAP in order to be in with the chance of winning the ‘Clinic & Hack Loyalty Prize’ for the 2014 season as well as the race for the annual points awards. Brown gloves should be worn with a bowler hat, well fitted and clean. Black gloves are a major faux pas because traditionally, black gloves signified that you were in mourning and therefore shouldn’t be riding. Habits can be of navy, black or tweed in colour. A light- coloured waistcoat, plain or with light check, should be worn under the habit with the lowest button left undone. The jacket should sit just above the saddle when mounted. It should be straight and have sleeves of a correct length so that when the rider’s arms are stretched, they are not too short. Champion & Wilton leather seat. 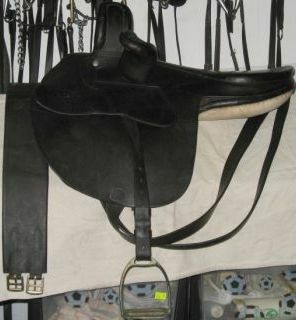 Complete with stirrup/leather 3 fold leather girth and balance straps in excellent condition. 16″ from cut back to centre back. 21″ from front of pommel to centre back. Will fit a lady riding light to medium weight hunter or a thoroughbred type. 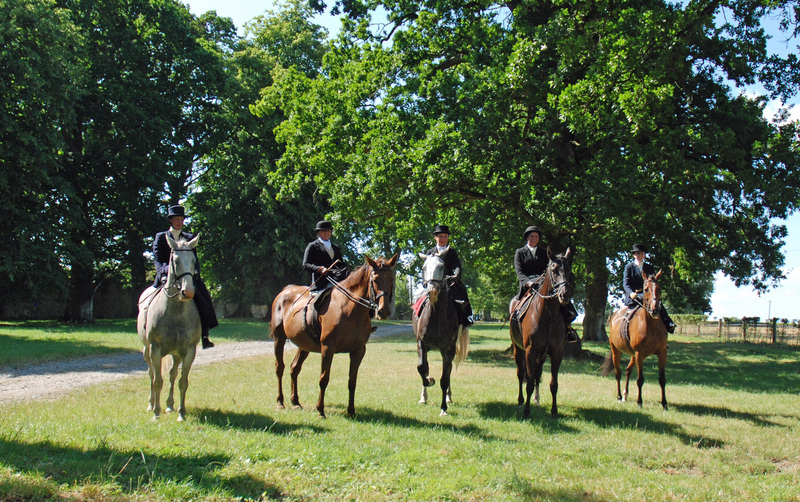 Members of the Side Saddle Association enjoyed a summer hack at Borris House on Saturday the 20th of July. The hack was organised by association member Ciara O’Connell and took place on the grounds of the estate by kind permission of Mr &Mrs Morgan Mac Murrough Kavanagh. The intact walled estate includes a square mile of land and has been the ancestral home of the Mac Murrough Kavanagh family, the high kings of Leinster, for the past five hundred years. 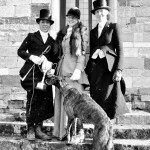 This historic venue provided the perfect backdrop as nine ladies in full side saddle attire set off across the estate riding on cross country tracks through the woods and fields. The wooded areas provided welcome shade from the sun and a splash through the river was enjoyed by horses and riders. 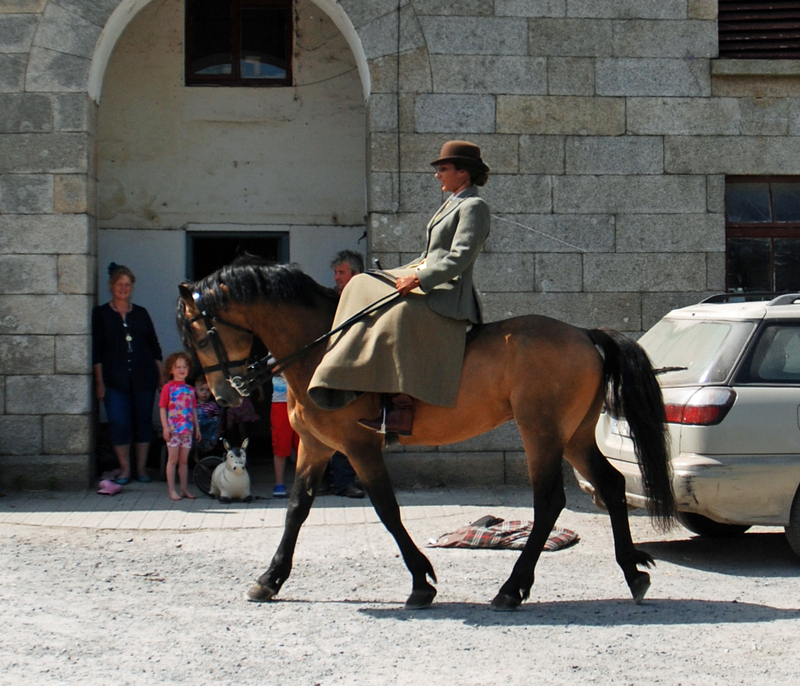 The Irish ladies enjoyed the company of a member of the Spanish Side Saddle Association on the day. Andrea Muro Nebreda enjoyed her first Irish side saddle hack riding aside dun Connemara stallion Coral Mistys Comic. 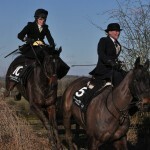 She was accompanied by the stallion’s owner renowned side saddle rider Susan Oakes from County Meath. 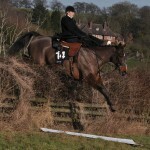 Susan also took part in the hack on board her grey stallion SIEC Atlas. This stallion is an experienced international show jumper and is one of the horses that will travel to Aintree with Oakes next week as she aims to break the world side saddle show jumping record as part of the Leaping Ladies Side Saddle Challenge. The pair were joined on the day by Sarah Conway, Niamh Drea, Aine Dagg, Sarah Moran, Lorna Keogh and Jennifer Maher Mulcahy while Ciara O’Connell led the way on her own liver chestnut mare Texas Diamond. This was Ciara’s first side saddle outing since the birth of her beautiful daughter Charlotte seven weeks ago. Last week I received one of those wonderful and unexpected texts that invites you to come on an adventure. 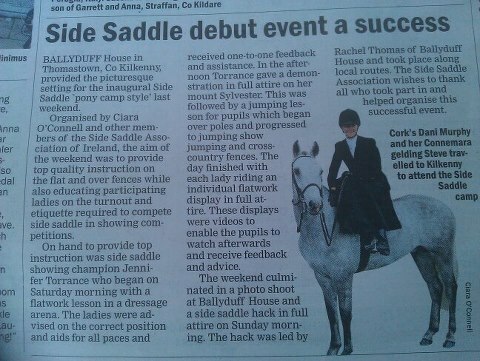 The adventure in this case was a side saddle hack at Mount Juliet. Having only sat on a horse side saddle twice before, once at a ‘give it a go’ day and once on my horse in a borrowed saddle I am definitely a novice but my answer was definitely yes. 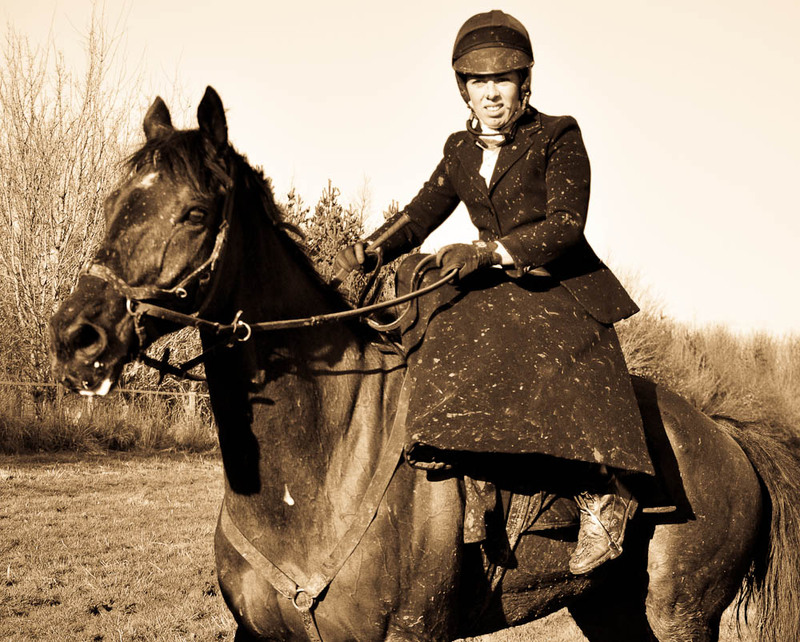 Last week, thanks to the Facebook page belonging to the Irish Side Saddle Association, I was able to take a crash course in side saddle etiquette. 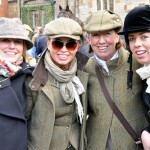 Gloves should not be black (as this means you are in mourning), there should seven or nine plaits in the horse’s mane, hairnets are essential, comfortable underwear is advised and your hat should match the colour of your boots. 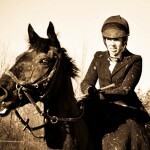 I think in part it is this, the tradition and the elegance that has attracted me to side saddle. I have learned to ride all my life from Mary Kane a lady who believes in the old school importance and etiquette of turnout and while I am not adverse to a bling brow band or a splash of colour there is something very beautiful about seeing centuries old traditions honoured and brought to life. On the day of the hack two friends and I enjoyed a road trip to the stunning Mount Juliet estate. We arrived at the stables and were introduced to our mounts, in my case a grey Connemara pony called Harry. Our horses were beautifully turned out in spotless tack thanks to the staff and helpers from the equestrian centre and the association members. Habit fitting and the art of getting dressed came next where I was dressed expertly by Verity O’Mahony and Ciara O’Connell in Ciara’s tweed habit. Given the biting wind I was pleasantly surprised by how warm a habit is. Once mounted, I received some advice from Ciara. My regular flatwork position of hands close and in front of the saddle was altered to bring my hands apart and back to allow one hand either side of my knee with a bend in my elbows. As we walked around I attempted to rearrange my confused body into the correct position – right toe down, right shoulder back, right hip down. This was my mantra for the day. We were joined on the hack by Susan Oakes who rode racehorse Parsons Pistol. This horse has already won seven races and will be going for the champion hunters chase with Susan in Punchestown. 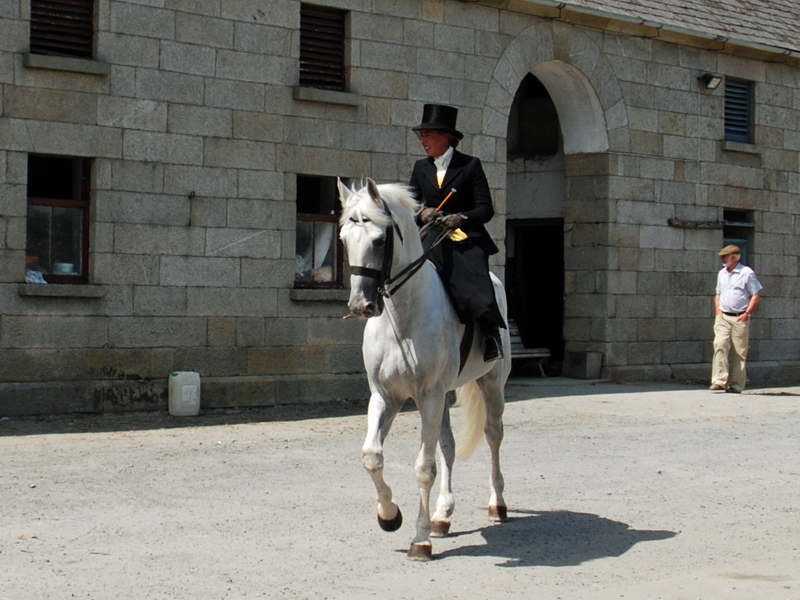 Led by our guides Tara Monaghan and Elaine Roche from Mount Juliet Equestrian who rode astride we set off across the land, a group of ladies and horses with saddles and accessories from a bygone era steeped in tradition. We set off across the bridge and trotted along the river. At first I was unbalanced in trot but upon reminding myself of the purpose of my right leg (I,.e. to hold me on!) it all clicked and Harry and I strutted along comfortably with me feeling like a lady of the manor. At this point the group split in two with the more experienced riders heading on the fast route and the more novice riders taking the steadier route. I decided not to get ahead of myself and headed on the quieter route where our guide took us walking and trotting through the woods until we rejoined with the rest at the cross country field. Buoyed on by Tara as my guide I headed off for a canter around the field. That was it, I knew in that moment, cantering along relaxed and happy, I was hooked. I do often ask myself why I am incapable of becoming hooked on an indoor hobby that requires little time or money but it appears the universe has decided that it is not for me. On we went and I attempted my first cross country fences, first a small step out of the water and then as the adrenaline kicked in up and down off a small step. The advice I was given was to keep my left shoulder towards the horses right ear and my hips even coming down off the step to ensure I did not tip left while allowing the horse to jump. Harry knew his job and carried me happily over whatever was asked of him. 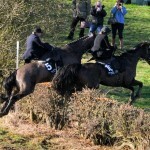 After watching some of the more experienced riders clearing the fences we headed back through the estate to the stables. As we hacked back I was filled with that ‘if only it could last longer’ feeling, a universal sign of a great time. I suspect I may have used muscles that I have not used since the ‘give it a go’ day. No doubt I will find out soon. The second hack group mounted up and gave me as a spectator an education in side saddle. Katie Wrest and Hanna Bjoremark warmed up in the sand arena effortlessly demonstrating dressage. From flying changes to collections and extensions this was spectacular to watch. The group were joined by Susan Oakes on O’Muirheartaigh. O’Muirheartaiugh, ridden bitless and sidesaddle, expertly took on the course even giving a lead to fellow horse and riders. O’Muirheartaigh will compete, ridden by Susan, in the La Touche race at the Punchestown festival at the end of the month. This will be the first time a horse competes on the track in a bitless bridle. 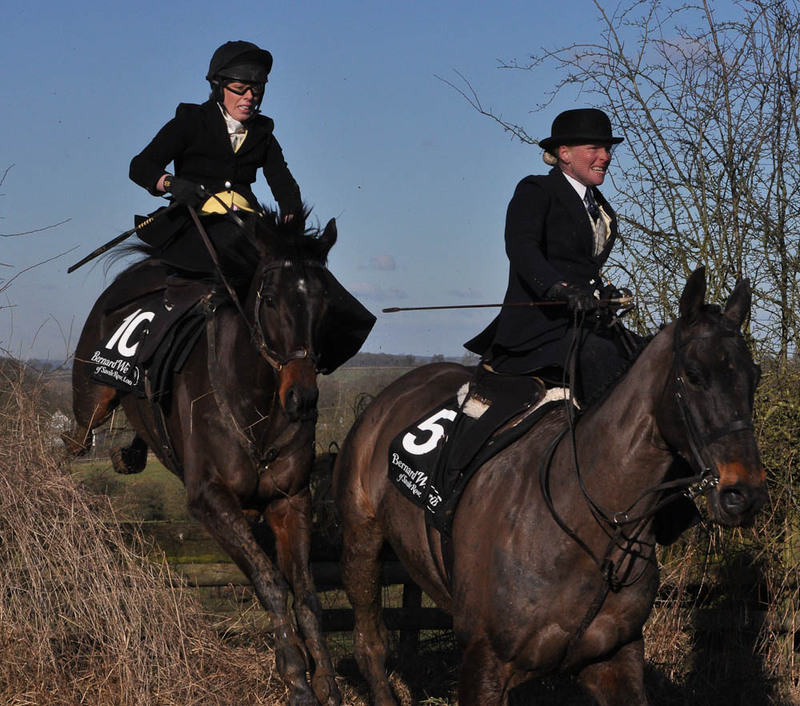 The pair are currently the reigning champions of the Dianas of the Chase side saddle steeplechase which was the first race of its kind since 1927. Camera in hand we followed the group across the estate back to the cross country field where the ladies really took on the fences. From banks to tyres to coffin fences they sailed over in style. Young Zara Nelson flew around the course on her grey pony Fred making it all look a lot easier than it is. Susan Oakes showed us all how it is done sailing over the open bank with ease. It is only when I watched this did I realise how important the seat and position are and how much balance you need. It is safe to say I have a long way to go. What has struck me most about this hack is the dedication and selflessness of the organisers and volunteers. From dressing riders to lending habits and waistcoats to giving encouragement and advice Ciara O’Connell, Kalindi Lawrence, Verity O’Mahony, Jennifer Torrance, Dermot Hanniffy and their crew went out of their way to ensure everyone enjoyed the day and to give everyone the opportunity to learn more. Every time I tell anyone about side saddle I hear ‘oh I wish I could do that’. I know, I felt that way last year and I have been amazed at how accessible it all is and how many people will help you. The next ‘give it a go days’ will be held on April 20th and the 11th of May at Ardmulcan in Co. Meath. 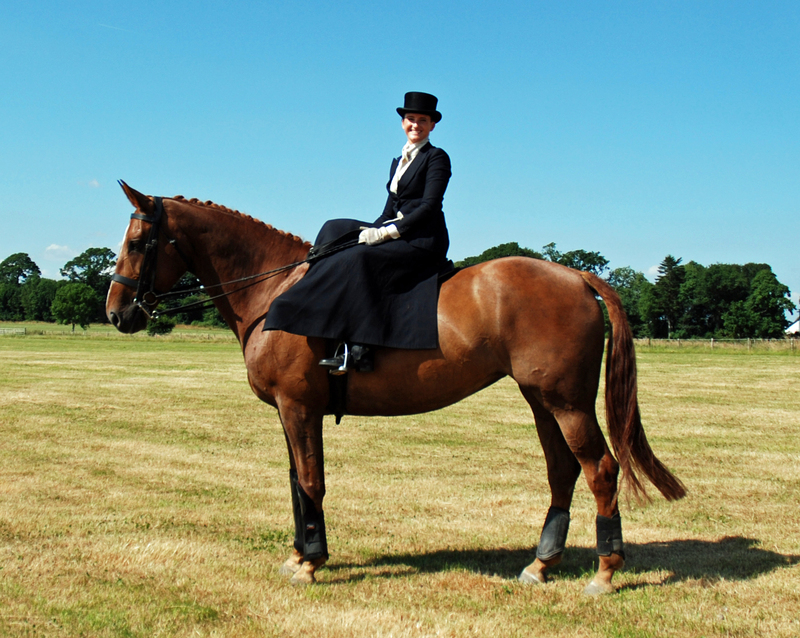 If you are reading this thinking that like me you have always wanted to try side saddle you would be mad not to contact the Irish Side Saddle Association and sign up to try it. 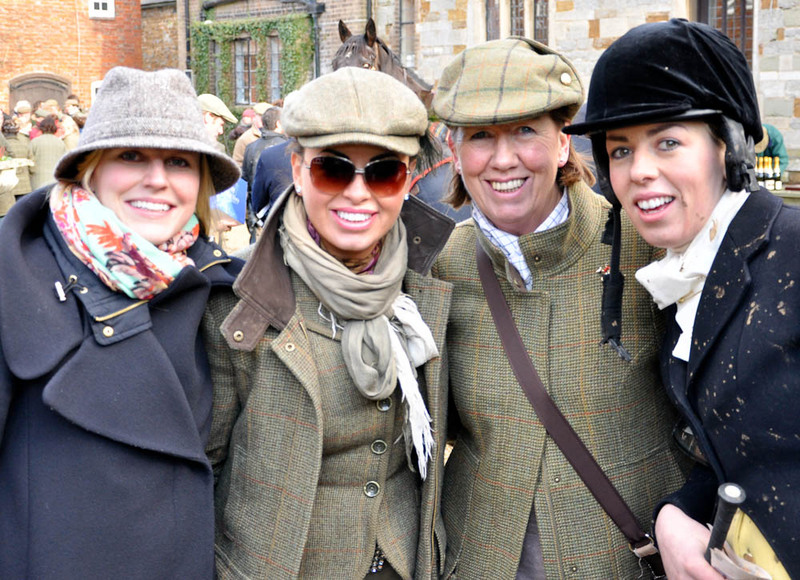 On the 2nd Feburary 2013, elegant Ladies from both the UK and Ireland embarked on Ingarsby Hall, Melton Mowbray for the first ever running of the Bernard Weatherill Side Saddle Chase. It was the first race of its kind to be held since the second world war and was by kind permission of Formula 1 Legend Brian Henton. 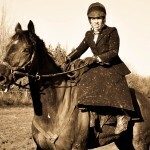 The idea was that of well known jeweler designer and sidesaddle rider Philippa Holland. 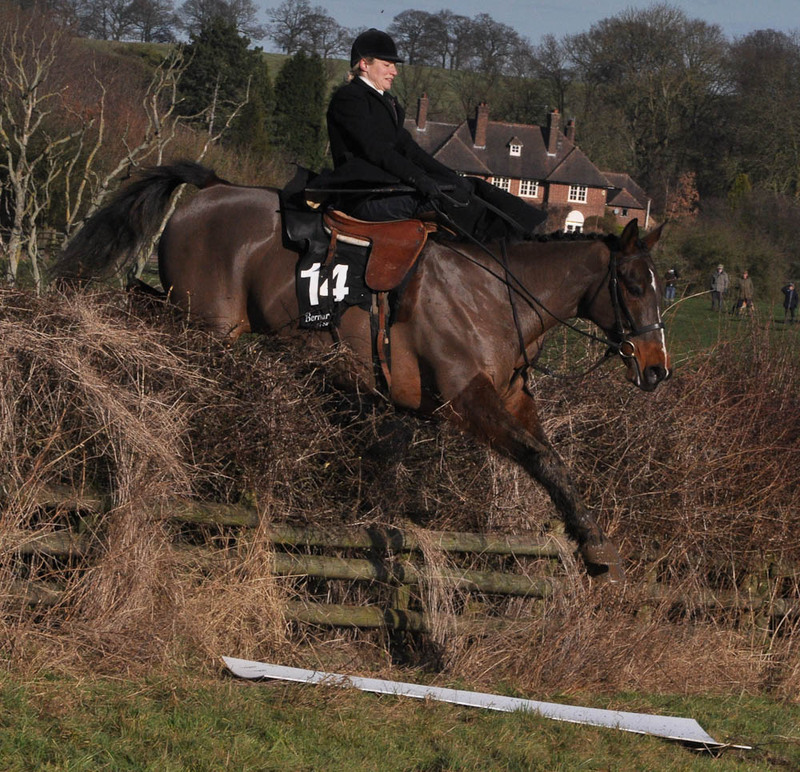 The course was over the famous Quorn Hunt countryside of post & rails and hedges. Sixteen brave ladies mounted their steeds in the courtyard prior to the race for a photocall and then cantered to the start. The going on the course was soft to heavy in places. When the flag was dropped there was a mighty charge to the first, where there were 3 fallers but luckily no injuries . 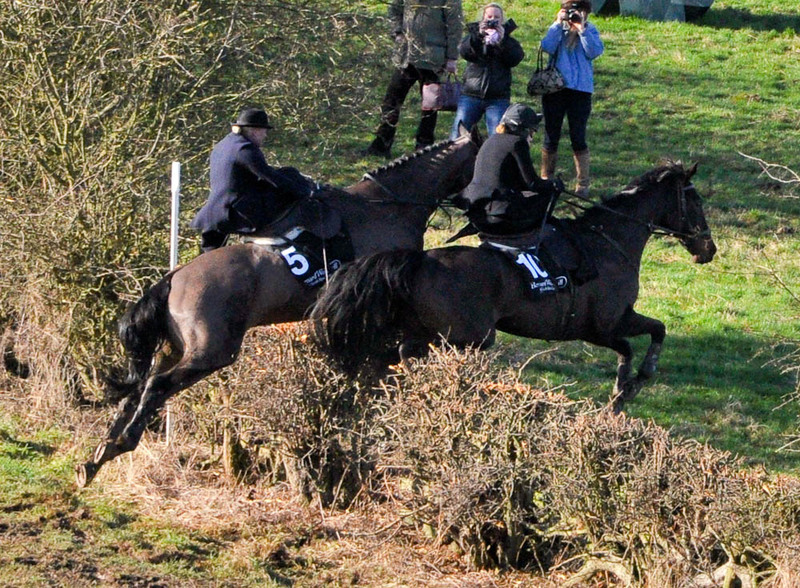 The pace began to quicken and coming to the fifth from home all partnerships were still in tacked but two riders Lizzie Harris from the Pytchley Hunt and Susan Oakes from The Meath Hunt started to pull clear. What an exciting finished it turned out to be, both ladies jumped the second last and last upsides but on the way to the line Oakes got her horse O’Muircheartaigh up to win by a length. 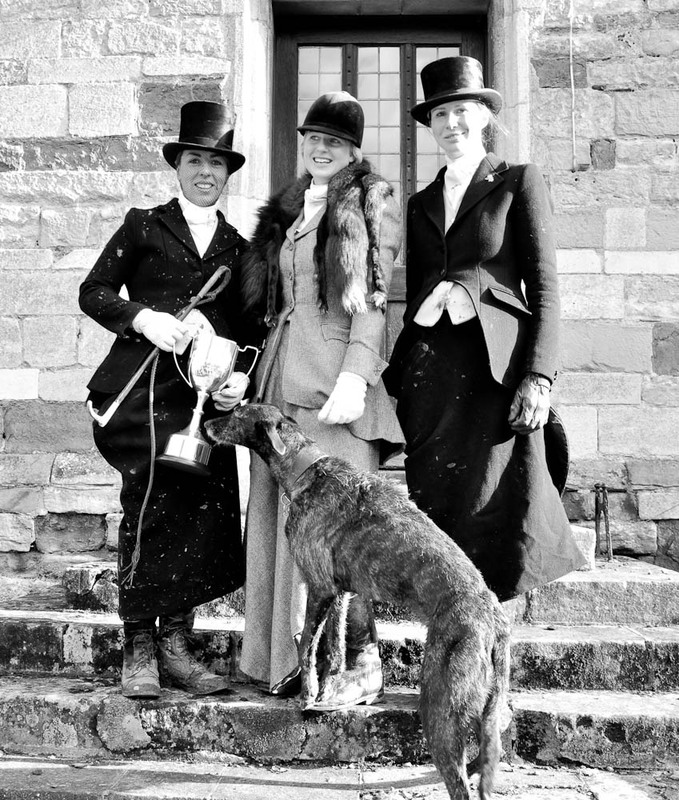 The winning rider is world renowned for her sidesaddle endeavors and her horse was a one time top National Hunt racehorse who she now competes regularly on the point to point scene. The horse is somewhat of a quirky character, he is the only horse running under rules in the Micklem bitless bridle and this was he second time under side saddle. ‘I had the ride of my life, it was a difficult decision whether to bring him or not as he has a mind of his own and it was either going to be a great success or a complete disaster, thankfully it was a great day’. 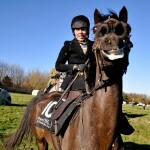 Oakes also added ‘It was a privilege riding along side similar minded Lady riders that like a challenge. I’m delighted with my prize of a bespoke Bernard Weatherill Habit, which in March I will go to Saville Row for first measurments and hopefully this habit will be ready for when I attempt to break my own high jump record in July on SIEC Atlas in Aintree. 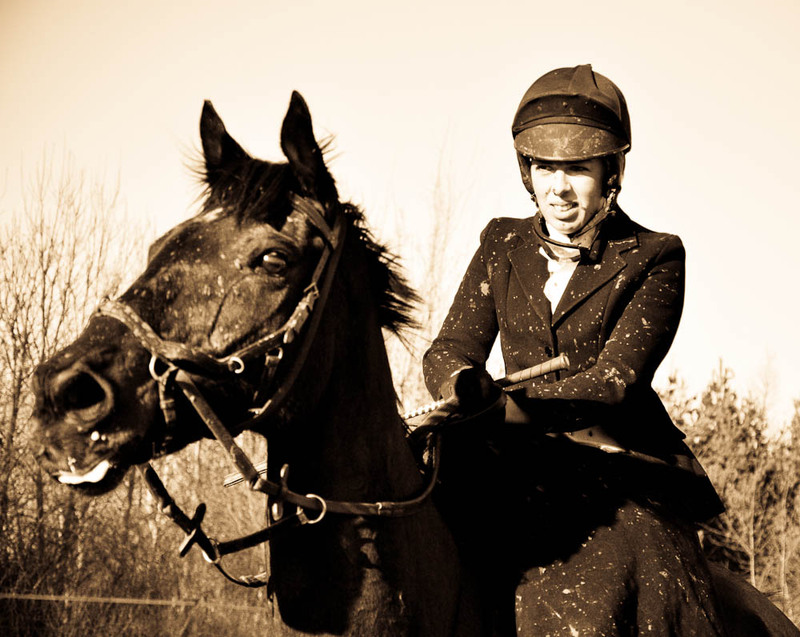 My inspiration to come here was to follow in the footsteps of the orginal side saddle steeplechaser Mrs Nannie Power O’Donoghue who was the only lady who ever rode in 3 steeplechases in Punchestown, Fairyhouse and Balydoyle in the early 1900’s’. Click on here to see the video. 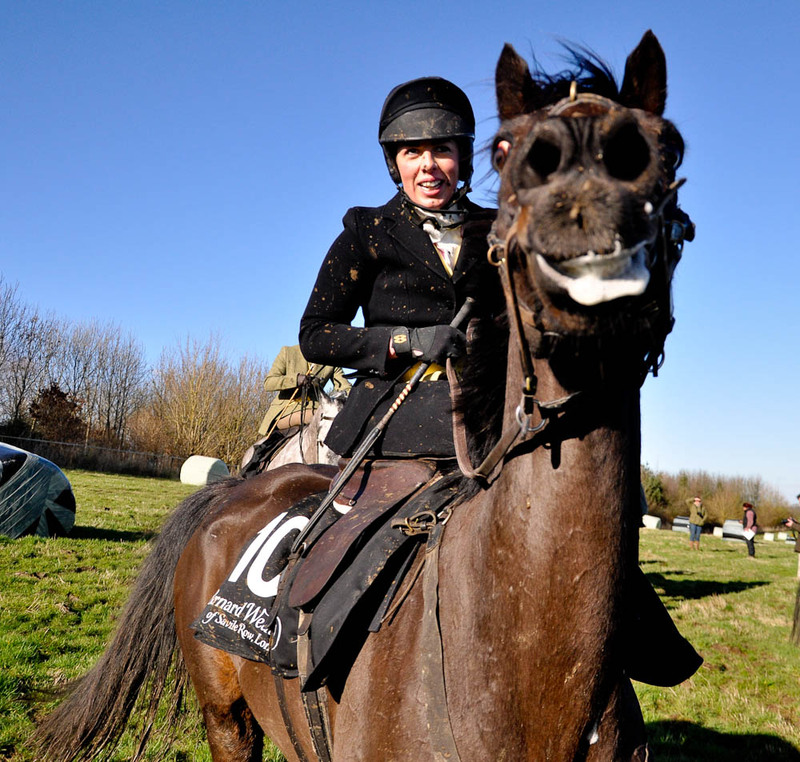 This week P2P.IE profiles Susan Oakes, the Meath woman holds the World High Jump Record for Side Saddle, we follow her schooling Parsons Pistol at Skryne Gallops, running in the Open Lightweight at Ballydarragh, and a few days later she takes fellow point-to-point riders Annie Bowles and Aine Dagg riding side saddle. We also see her coach Paraic Geraghty putting her through her paces with her grey stallion SIEC Atlas (Acord li- Baroness II- Coriander).